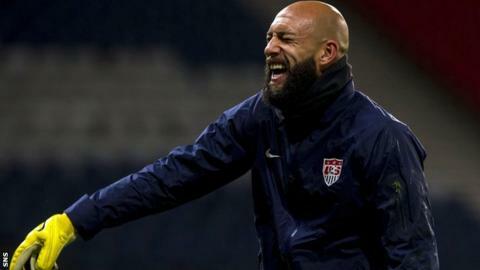 Tim Howard will captain USA while hoping to silence Everton team-mate Steven Naismith when their sides meet in Friday's Hampden Park friendly. The goalkeeper takes the armband from injured midfielder Clint Dempsey for the match against Naismith's Scotland. "We know what they offer in attack and I will certainly do my best to keep Naisy out as I will never hear the end of it," said Howard. "He has been chirping in my ear for the last two or three weeks." The Americans hammered Scotland 5-1 in Jacksonville in May 2012, but the visitors are expecting a tougher game, putting Scotland's poor performance down to it being at the end of the season. "They are dangerous, certainly, we will have our work cut out," said Howard. "Steven Fletcher is a natural goalscorer - he just gets himself in the right positions. "Robert Snodgrass is tricky. The way he hits the ball means that as a goalkeeper you always have to be on your mettle. "It will be very difficult for us. They are going to make it hard as it is on their own turf." USA also play Austria in Vienna next week as they continue their preparations for the 2014 World Cup finals in Brazil and coach Jurgen Klinsmann expects his side will given a tough test in Glasgow. "We wanted to go to Europe specifically and prove a point - that we want to compete one day with the best in the world," he said. "It will take some a while to get there, but we are going through a process of improvement. "This game is going to be a benchmark for a team trying to do better. "It is part of a learning process and we are looking forward to it." Former Inter Milan, Bayern Munich and Tottenham striker Klinsmann is putting the Scots' performance under previous coach Craig Levein last May down as a one-off. "It is a completely different game and we are well aware of that," he said. "Scotland did us a favour coming over after their season was over, in 95 degrees, and we knew it was going to be very difficult for us. "We were on a totally different page then. We know that Scotland. in any given moment, can score and can beat us, so we are going to be very alert."